Abraham Sussman waited for the Second World War to end before he would be born, and has been a peace activist ever since. 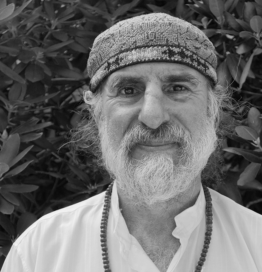 A Senior Teacher in the Sufi Ruhaniat International, a musician, and a Clinical Psychologist, Abraham has been travelling worldwide in recent years on the path of the awakened heart. Gardener, father, woodsman, candlemaker, friend of the oppressed and lover of truth, Abraham, with his wife Halima, has led workshops and trainings in Russia, Colombia, New Zealand, Australia, Holland, Mexico, Ecuador and throughout the United States, realizing that the heart in all of us is one and the same. Very happy to be returning to Great Mother, where community and creativity are celebrated together.